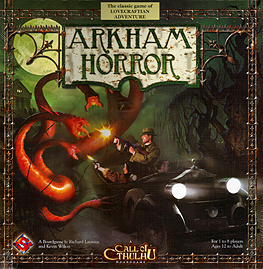 The classic game of Lovecraftian adventure returns in a new edition after almost 20 years! Although it will work with 1-8 players the recommended number is 3-5 which is in line with our experience with the original game. The one thing I love in games is when afterward you can recount the stories to your friends. Arkham Horror enables this in spades! Here's an example: Dexter Drake, the stage magician is investigating the deeper mysteries of magic and the occult in Arkham. To get the word on the street, he goes drinking at the road house, but unwittingly has his drink spiked and wakes up minus his wallet. Going straight to the bank for a loan to replace his cash, he then encounters a monster so foul that it sends him gibbering to the asylum. A period of rest follows and a slightly more unhinged Drake leaves. Now the monsters are everywhere! The streets aren't safe! Driven by little more than madness, he assaults and destroys several of their number before the darkness overtakes him... The short version: if you don't mind dice rolls and card draws as mechanics and you want a game you will remember and talk about, then buy this game or BE DEVOURED! This is a little gem of a game. Everytime we have played it people have wanted to play again which is always a good sign with a game that has a longer play time. The pieces are beautifully made and fit the overall theme very well, the text on the cards, characters and monsters just pile on the theme and atmosphere. Even playing with 8 people everyone feels part of the game as others take their turns. I won't deny the rules are complex at first glance but are easier to understand during play. But even getting some of the rules wrong adds to the fun so this is not a big problem. This is a cooperative game where you play a group of people trying to halt the onslaught of monsters within Arkham and trying to prevent the awakening of one of the Ancient Ones. There are lots of elements to this game and plenty for each player to do each turn. There is a lot of things that can only be achieved by people doing different tasks. Each of the characters in this game has unique qualities that aid them and others in the game, making it interesting to try playing the game with different characters each time. Arkham has lots of pieces, cards and a very large colourful board. The game last about 4 hours but it does not feel like a long game when playing as you are gripped all the way through as you try to battle the forces of evil within the game. This is a very atmospheric boardgame and I would recommend this to anyone as it has loads of replayability and that's without looking at the various expansions..
Like wizball I missed out on the original, but having played this solo as well as multiplayer it is a game that is so much fun as players run around Arkham fighting the monsters and closing the gates to prevent the Ancient One from waking up. There are a lot of pieces in this game so you get good value for money. There are several decks of cards and during play all will get used at some point or another, yet despite all these pieces, the game is quite straightforward to play. A round consists of an Upkeep phase to reset your investigator, a movement phase to move around the board, an encounter phase to fight the monsters and attempt to close gates and a mythos phase where more monsters can appear. Basically thats it, but of course this game has much more depth to it than the simple round outline suggests. Highly recommended whether you like to play solo or with a group of up to eight as it scales well. Never played the original version of this game and I must admit that I have missed out. Although talking to someone that has the game, it has been improved in many ways. You each take a character and then go around collecting items, killing monsters and closing gates. It is you against the board and working together using each others strengths and weaknesses seem to be pretty important. The charaters that I saw in the game where all pretty well balanaced and the game was really good fun. Can I recommend it definately at this price it is good value for money and a game that I am looking forward to playing again.